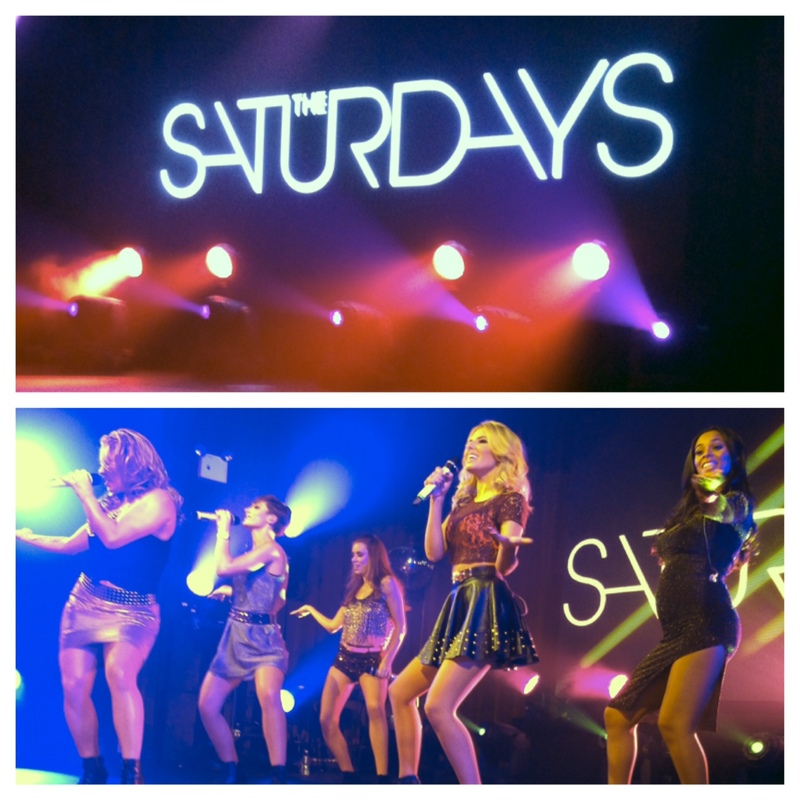 MELISMATIC: LIVE FROM NEW YORK: It's THE SATURDAYS Night (with Kerli)!! 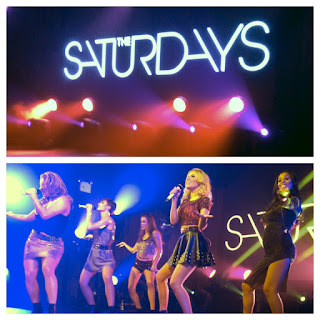 LIVE FROM NEW YORK: It's THE SATURDAYS Night (with Kerli)!! The title for this post is so appropriate, it's almost like I've waited since this blog started in 2008 to use it (oh, wait -- I have). "We're really in America!" 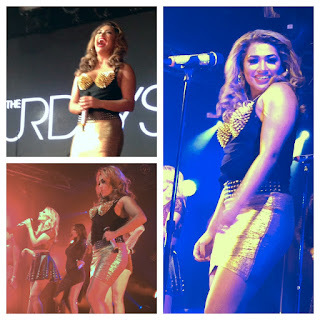 That was the sentiment expressed by The Saturdays and felt by the fandom present at the Highland Ballroom in the Chelsea neighborhood of NYC on Thursday night. The Saturdays are literally an artist I've followed since the very beginning of this blog (their song "Up!" was my #1 song of 2008 in my very first "official" countdown posting) and I was priviledged to be in their company while they commanded the stage in their very first headlining performance in the US's East Coast. The show began five minutes early (how many times has that ever happened?) 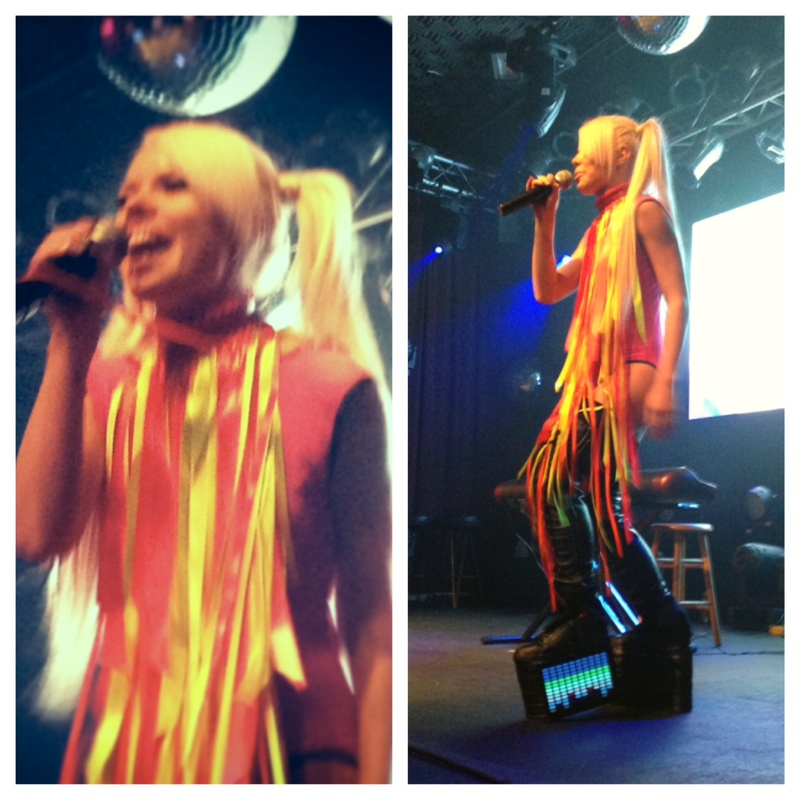 when surprise opening act Kerli bounded onstage in white-blonde pigtails and some sort of turtle-necked pink bathsuit with a flock of multi-colored neon ribbon fringe with DJ and keyboardest in tow. For those of you who aren't as familiar, Kerli is an Estonian left-of-center dance-club pop artist that is a bit like a cross of Robyn and Bjork. She is best known to the non-club scene for her early singles "Walking On Air" and "Love Is Dead" back in 2008, and for co-writing Demi Lovato's big comeback track, "Skyscraper" (it was originally set to be for Kerli's own project, still upcoming). She radiated positive energy and really got the crowd hyped up very quickly with a small handful of her bigger dance tracks, including "Zero Gravity," "The Lucky Ones" and the high-energy, unreleased "Can't Control the Kids" (title?) which includes the refrain of "Put Your Hearts Up," complete with the heart symbol made with your hands. Her sophomore album release, Utopia, is set for release later this year on Warner. No sooner had she come onstage was she off it, however just a few seconds after that, she appeared a few feet from where we were standing exiting backstage. She walked right into the crowd of fans and took a photo with yours truly, blindsided as I was. As we patiently waited for La Satz to grace America with their Glitter, we were informed by a man with a very large camera that they were filming for their upcoming E! reality show, Chasing The Saturdays, set to debut this Sunday -- and that there was a very real possibility of us being in the background of the shots. So there you go -- you all have no excuses to not watch as you might catch a glimpse of yours truly (just kidding...hopefully). Not long after, a keen eye behind me spotted dutty rapper Sean Paul make his way backstage inches from my person. The reception wasn't very warm (literally: "Oh, there's Sean Paul." *awkward stares*), but it became clear the ladies would be performing the version of "What About Us" with him that night. Later, rumors ran rampant that Marvin of JLS fame was also there to cheer the girls on (well, he is Rochelle's Baby Daddy after all), and proved to be pretty true. Around 9:40PM, our girls finally took the stage and kicked things off with a bang via "Notorious." They all looked fantastic and glamorous: Una in shorts and a silver spangled top; Vanessa in a black corset with gold studs and a tight gold skirt; Mollie in a black leather skirt and a rose colored lace crop top; Frankie in a grey dress; and Rochelle, several months pregnant with a very noticeable "bump" in a tight, glittery dress with a rather daring slit up to her thigh (complete with black sneakers...or as the Brits say, trainers). The material performed was a pretty decent mixture in terms of mostly singles from all of their previous UK releases, including "Ego", "Forever Is Over" and "All Fired Up", along with some surprising B-Sides in "Get Ready, Get Set" from On Your Radar and "Chasing Lights" from Chasing Lights. Original reactions from the girls initial Stateside performances have been slightly mixed with some side-eye looks at Ms. Vanessa, the generally agreed upon "belter" of the group, as she sounded quite a bit strained. I feel it is my duty as a Saturdays fan to say she was really on her A-Game at the Highland, warbling out those melismas like it was nobody's business. This was especially the case when the stools were dragged out and "Issues" was cued up. Vanessa quickly curtailed the song with a glare to the audio team, telling them to play the intrumental version without the follow vocals, a clear point at the proof that she (and the rest of the girls) can sing live. At this, Una jumped right up and grabbed a guitar (on hand for the following song, "Chasing Lights") and the group decided to perform "Issues" acoustically instead, there on the spot. "Chasing Lights" was performed similarly, with both Una and Mollie playing guitar. WATCH: Full HD vids of the acoustic versions of "Issues" and "Chasing Lights" are available via my YouTube channel (for as long as they last, anyway). They are pretty Una/Mollie focused as they were closest to me. Forgive the singing - the boys behind me were very psyched, as was I. But the majority of the night was all up-tempo dance tracks (with nary a "Wordshaker" in sight, I'm afraid). They closed the show with "What About Us" with a predictable entrace by Sean Paul. (Watch part of that clusterf*ck of a perf via my video here.) I'm still quite keen on the non-Sean Paul version and that performance didn't do much to sway my thoughts. The girls waved goodbye with smirks and walked offstage while the crowded demanded an encore, and they returned minutes later to perform "Higher" before truly bowing out. All five of the girls were so energetic and lively -- Rochelle, despite her gorgeous with-child physique, came over to grab all of our hands (which took me totally off guard as I was video filming at the time), as did Mollie. Vanessa was all smiles and general fiercitude all night and Frankie and Una both waved on their way out. So basically, what I'm saying is, we are BFFs now and I am officially the Sixth Saturday. Mission Accomplished. Thanks so much for sharing this. I'm hopeful but not delusional enough to think that this is a done deal. I just don't think "What About Us" is the track to do it.